Trauma to the shoulder is common. Injuries range from a separated shoulder resulting from a fall onto the shoulder to a high-speed car accident that fractures the shoulder blade (scapula) or collar bone (clavicle). One thing is certain: everyone injures his or her shoulder at some point in life. These bones are joined together by soft tissues (ligaments, tendons, muscles, and joint capsule) to form a platform for the arm to work. The shoulder also has one articulation, which is the relationship between the scapula (shoulder blade) and the chest wall. The main joint of the shoulder is the glenohumeral joint. This joint comprises a ball (the humeral head) on a golf-tee-shaped joint (the glenoid of the scapula). The bones of the shoulder are covered by several layers of soft tissues. > The top layer is the deltoid muscle, a muscle just beneath the skin, which gives the shoulder a rounded appearance. The deltoid muscle helps to bring the arm overhead. > Directly beneath the deltoid muscle is sub-deltoid bursa, a fluid-filled sac, analogous to a water balloon. > Fractures are broken bones. Fractures commonly involve the clavicle (collar bone), proximal humerus (top of the upper arm bone), and scapula (shoulder blade). > Dislocations occur when the bones on opposite sides of a joint do not line up. Dislocations can involve any of three different joints. > A dislocation of the sternoclavicular joint interrupts the connection between the clavicle and the breastbone (sternum). > The glenohumeral joint (the ball and socket joint of the shoulder) can be dislocated toward the front (anteriorly) or toward the back (posteriorly). > Soft-tissue injuries are tears of the ligaments, tendons, muscles, and joint capsule of the shoulder, such as rotator cuff tears and labral tears. Fractures of the clavicle or the proximal humerus can be caused by a direct blow to the area from a fall, collision, or motor vehicle accident. Because the scapula is protected by the chest and surrounding muscles, it is not easily fractured. Therefore, fractures of the scapula are usually caused by high-energy trauma, such as a high speed motor vehicle accident. Scapula fractures are often associated with injuries to the chest. Anterior dislocations of the shoulder are caused by the arm being forcefully twisted outward (external rotation) when the arm is above the level of the shoulder. These injuries can occur from many different causes, including a fall or a direct blow to the shoulder. Posterior dislocations of the shoulder are much less common than anterior dislocations of the shoulder. Posterior dislocations often occur from seizures or electric shocks when the muscles of the front of the shoulder contract and forcefully tighten. 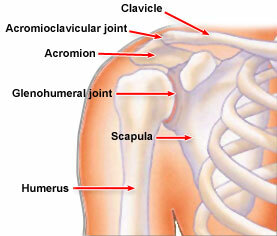 Dislocations of the acromioclavicular joint can be caused by a fall onto the shoulder or from lifting heavy objects. The term “shoulder separation” is not really correct, because the joint injured is actually not the true shoulder joint. Most fractures are diagnosed with X-rays of the area and by physical examination. Sometimes, additional imaging techniques, such as computed tomography, are necessary. Most fractures of the scapula can be treated without surgery. Treatment involves immobilization with a sling or shoulder immobilizer, icing, and pain medications. The patient will be examined for additional injuries. About 10% to 20% of scapula fractures need surgery. Fractures that need surgery usually have fracture fragments involving the shoulder joint or there is an additional fracture of the clavicle. Surgery involves fixation of the fracture fragments with plates and screws. Treatment of shoulder separations is based on the severity of the injury as well as the direction of the separation and the physical requirements of the patient. Less severe shoulder separations are usually treated without surgery. Severe separations in an upward direction or dislocations in the backward or downward directions often require surgery. Surgery involves repair of the ligaments. Professional athletes and manual laborers are often treated with surgery, but the results are often unpredictable. The initial treatment of a shoulder dislocation involves reducing the dislocation (“putting it back in the socket”). This usually involves treatment in the emergency room. The patient is given some mild sedation and pain medicine, usually through an intravenous line. Often, the physician will pull on the shoulder until the joint is realigned. Reduction is confirmed on an X-ray and the shoulder is then placed in a sling or special brace. Additional treatment at a later date is based on the patient’s age, evidence of persistent problems with the shoulder going out of place, and the underlying associated soft-tissue injury (either to the rotator cuff or the capsulolabral complex). Patients who are 25 years of age or younger generally require surgery. Persistent instability (repeat dislocations) of the shoulder usually requires surgery. Surgery involves repair of the torn soft tissues. If the injury was not severe, there is fairly rapid improvement and return of function after the first 4 to 6 weeks. Shoulder exercises, usually as part of a supervised physical therapy program, are usually necessary. Exercises decrease stiffness, improve range of motion, and help the patient regain muscle strength.